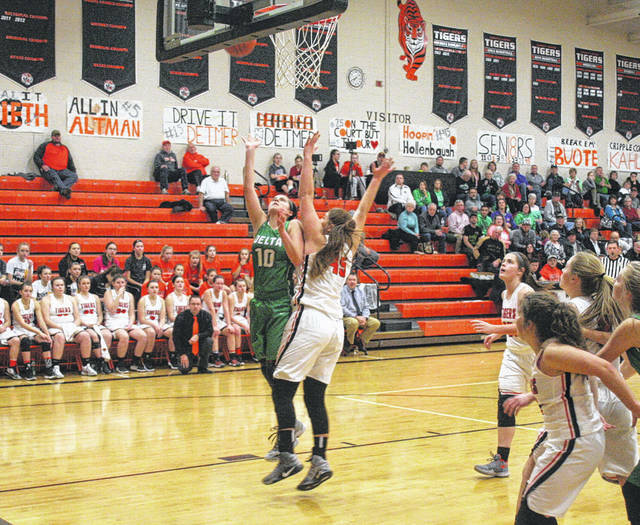 Abby Freeman of Delta knocks down a three-pointer in a game last season. She returns for the Panthers following a very successful junior campaign. Brooklyn Green lays one in for Delta versus Liberty Center a season ago. She is a returning letter winner for the Panthers in 2018-19. Brooklyn Wymer of Delta draws a foul in a tournament game last winter. She averaged nearly five (4.9) points per game in her freshman season. 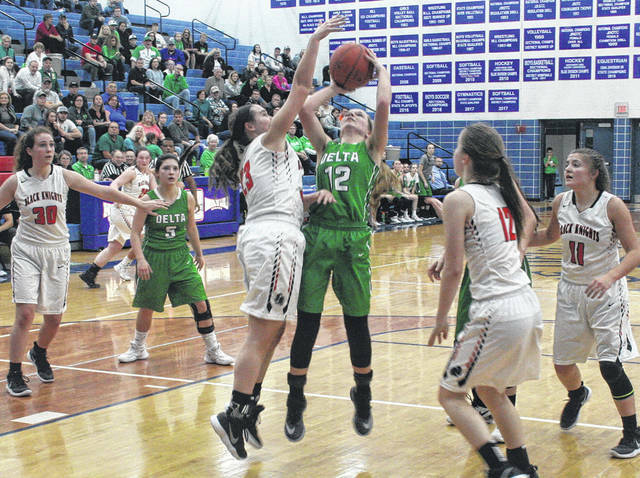 Despite losing a league scoring champion, Delta looks well positioned to defend their Northwest Ohio Athletic League title this year. Gone is Maddie Mattimore, a two-time scoring champion, and second team All-Ohioan. But, the Panthers, who were 23-2 last season, return three starters and six letter winners overall. Abby Freeman leads the way. The senior guard averaged 12.9 points and 3.2 rebounds per game last season and was named to the first team in the NWOAL and District, while also earning third team AP All-District honors. Freeman could also hit the 1,000 career points mark this season. Seniors Alayna Mitchell (1.7 ppg, 3.3 rpg) and Jessie Giguere (3 ppg, 3.4 rpg) also return to the starting lineup this season. Mitchell was honorable mention all league in 2017-18. A trio of talented sophomores round out the returning letter winners. Brooklyn Green averaged 7.4 points and 3 rebounds per game and was honorable mention all-league. 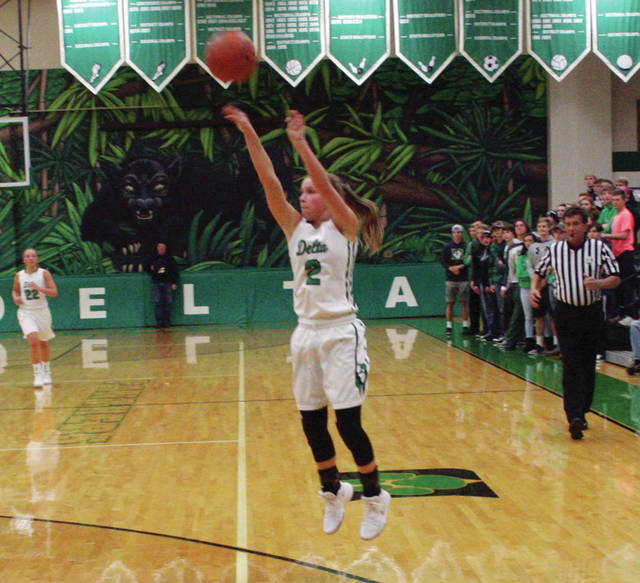 Braelyn Wymer was also honorable mention all-league after scoring 5.4 points and grabbing 2.3 rebounds per game. Brooklyn Wymer averaged 4.9 points and 2.7 rebounds per game as a freshman. Leadership, speed and team chemistry should be strengths for Delta. Ripke said that his team loves playing defense and coupled with good team speed, that should allow them to put a lot of pressure on the opponent at both ends. “We also seem to have really good team chemistry and great leadership. Our girls know their roles and take pride in doing what is needed for the team to be successful,” said the coach. Promising newcomers include sophomores Reagan Rouleau and Ella Ford. Despite the high expectations, youth could still be a weakness at times, according to the coach, who is in his ninth year at Delta. “I think the league this year is tough to predict because every team in the league lost key players but I also think we are all bringing back players that are capable of stepping into bigger roles than they had last year,” Ripke said.